Hitman emerge in a puff of stoner metal smoke with their new EP, Whiskey Downfall this Saturday. Movies would have us believe that a hitman is stealthy, works quickly and doesn't leave a trace. 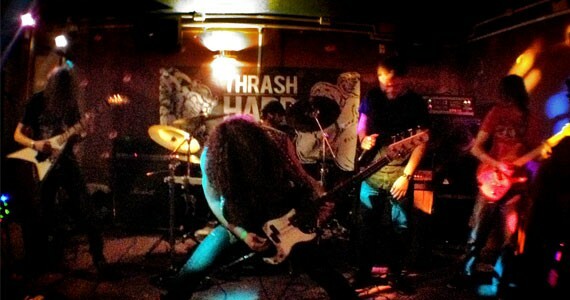 Halifax stoner metal band Hitman, however, makes quite a bit of noise, leaves trails of empty bottles in its wake and took about a year to make the new three-song EP, Whiskey Downfall. For fans of Black Label Society, Witch and Black Sabbath, Hitman's sacrifice on the full-album altar was certainly worth the wait. "We recorded it at NSCC with some amazing guys, Adam Gravelle and Bryce Holland," says bassist Andrew Coutts. "We're definitely really excited about it and it gives a good taste of what the full album is going to be like." Hitman steers clear of the extreme sludge side of stoner rock in favour of a catchier tune. "Definitely a groovier side of metal. We try to keep the riffs and choruses memorable and catchy but we definitely add a thrash and shred element that isn't included in most stoner metal," says Coutts. The riff-obsessed men---drummer Sylvain Coderre, Coutts, singer Jordan Rose and guitarists Mike Eisener and Ray Godin---look to the past, even further than Black Sabbath, for their lyrical inspiration. "We've actually been writing a lot of our songs about a guy from the 1800s named Tom Ketchum," says Coderre. "He used to rob trains until he met his unfortunate demise, being hanged in front of the town." A member of the Hole-In-The-Wall Gang, Ketchum's alleged last words were "I'll be in hell before you start breakfast, boys!" which, while it may be misreported, is prime lyrical material Hitman made good use of in the song "Noose." Make like Ketchum and saddle up to the swinging saloon doors of Michael's this Saturday to get your stoner metal fix.